C-Live provides trainee teachers with the most realistic classroom experience available short of standing in front of a class of real pupils. The avatar pupils represent a range of backgrounds and races that a teacher could expect to meet in a real classroom. Nothing is pre-recorded. The avatars are controlled by simulation specialists who ensure that the avatar responds realistically to what the trainee says and does. I found that when I had a live demonstration of the product the ‘pupils’ frequently put me on the spot, and were every bit as challenging as real pupils. However, a key difference is that if the trainee is unsure of how to respond to a particular situation, the simulation can be paused to allow the trainee to consider their response. 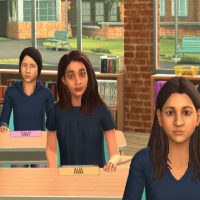 The classroom scenarios available include both primary and secondary classes. Additionally, there are also parent – teacher meeting scenarios available. The avatars have a very wide range of personality traits, as would be found in the real world. There are also a wide range of scenarios available, together with bespoke scenarios if required. This is an extremely realistic training tool which challenges trainees, but allows them to make (and rectify) errors in their teaching technique before they stand in front of a real class. I believe that in the fullness of time this excellent product will be a staple of any worthwhile teacher training course.